Today I will be reviewing a book that I'm sure you've all heard of. 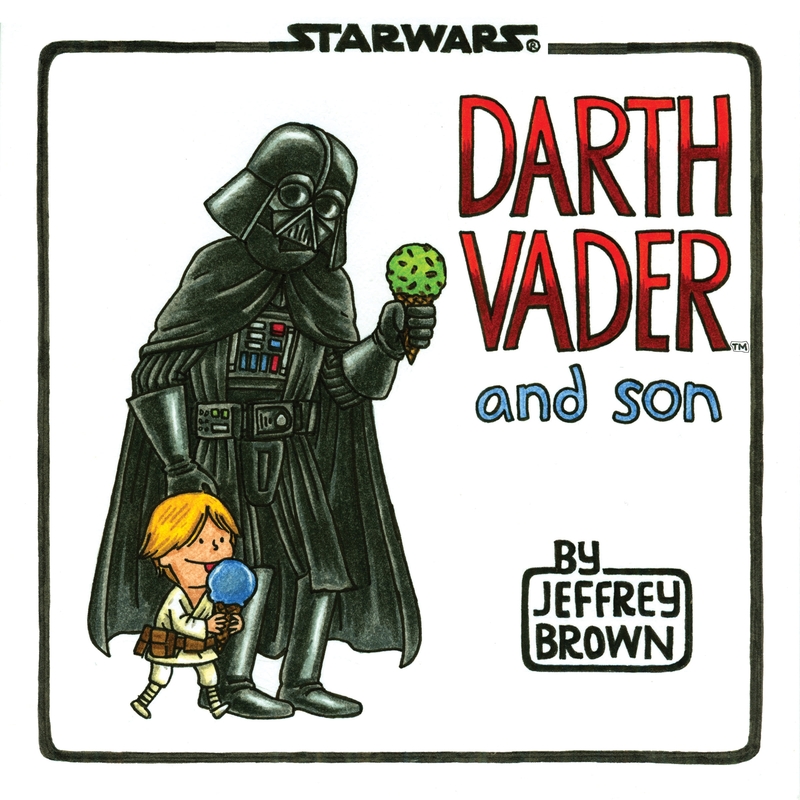 It's Darth Vader and Son by Jeffrey Brown. I read this book before it was cool. It's basically a compilation of really good one panel comic strips. Each one is usually Darth Vader reprimanding a 4 year old Luke Skywalker for doing something that little kids do like drawing on the wall or something. Sometimes it's just Luke asking Darth Vader a question he can't answer (like where do babies come from). I personally love the way that Darth Vader is turned into a responsible father and Luke is turned into a little 4 year old child. There aren't any scenes in this book. 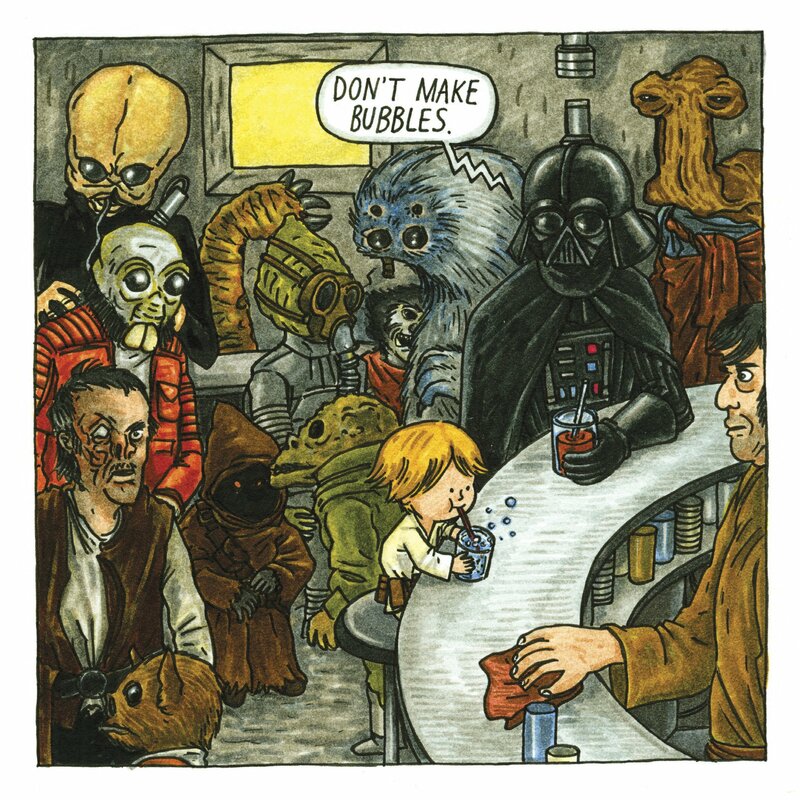 But a panel I like takes place in the scene on Endor where a bunch of storm troopers are outside of the metal station thing and Luke talks to them through the window, except this time Luke is telling them that his dad tells him not to talk to strangers. I love this panel because it made me laugh so hard the first time I read it. I think it's the funniest panel in the entire book. The drawing style in this book is the same as all of Jeffery Brown's other work. Very pencily. I loved this style in his other books and I love it now. I'm pretty sure that it was drawn with colored pencil. But I have a signed copy with a hand drawn picture and he used a marker to draw it so he could have used a marker to draw the book. Darth Vader and Son Is completely appropriate for all ages. I'm sure that anyone with a good sense of humor can enjoy it. If you haven't seen the Star Wars movies there will be some references you won't understand, but I'm sure that won't be an issue. I also forgot to mention that there is a sequel to Darth Vader and Son called Vader's Little Princess, which is the same as Darth Vader and Son, but with a teenage Princess Leia. I think that Darth Vader and Son is the best adaptation of Star Wars to date and I would give it 91/2 toddler Luke Skywalkers out of 10. Darth Vader always got a bad rap. He did what he had to do to survive, man! I'm very glad you reviewed this book that showed Mr. Vader in a positive light. You and Jeffrey Brown definitely know Star Wars better than I, but I know punctuation a smidge better than your guest editor. That's why I get the big bucks. Great review, boy. Can't wait to read the next one! Excellent review, Milo. You nailed it. Also, as the sometime breakfast cook, I particularly loved your inclusion of the "Don't you like the eggs I made" panel. You and I were there recently with my foray into fried - as opposed to scrambled - eggs. Oh boy, gonna have to by this one for the little Skywalker in my tummy!